Need Help Choosing the Right Faucet Aerator? How do I determine the size of the aerator? What is a male thread vs a female thread and how can I tell the difference? What are the different flow streams available in faucet aerators? How do I measure water pressure? What is a cache faucet aerator? With the help of a nickel and dime, you can easily determine the size of your aerator. First remove the insert and washer from the inside of the aerator. Set a nickel on top of the aerator, and if it’s almost the same circumference, the aerator is a regular size. If it’s not a regular size aerator, use a dime. The dime will fit inside a junior size aerator and will sit on top of a tom thumb size aerator. 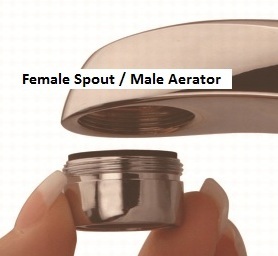 A female aerator has the threads on the inside of the aerator, whereas on a male aerator the threads are on the outside of the aerator. What are the different streams available in faucet aerators? Pick the stream that's right for you. Spray Stream is used to produce a miniature shower pattern and provides full coverage of hands during washing. Similar to the laminar stream, it is non-aerated and restricts the flow of water. Suggested for use in public lavatories. Laminar Stream produces a non-aerated water stream ideal for high flow applications or health care facilities with a beautiful crystal clear, non-splashing stream. Aerated/Bubble Stream mixes air into the water. It produces a larger, whiter stream that is soft to the touch and non-splashing. This stream is usually the choice for residential faucets. To measure pressure you'll want to get a pressure gauge with a hose bib adapter. After the gauge is screwed on, turn on the water supply and read what the PSI is. Measure pressure from a city water or reclaimed water source in the same manner as the pump, simply connect the pressure gauge to a hose, turn on and read. Measuring flow from a city water or reclaimed water source will be similar to measuring flow from a pump. If you have any questions you can always call your local public works or water authority to ask them the available flow and pressure (when on public water system - not a well). The Cache® faucet aerator threads directly (and disappears) into the faucet spout, making it vandal proof by design. Removal and installation is easy with the Cache® key. Cache® faucet aerators have been used by orignal equipment manufacturers since 2006. We carry the complete line of our Cache® faucet aerators.